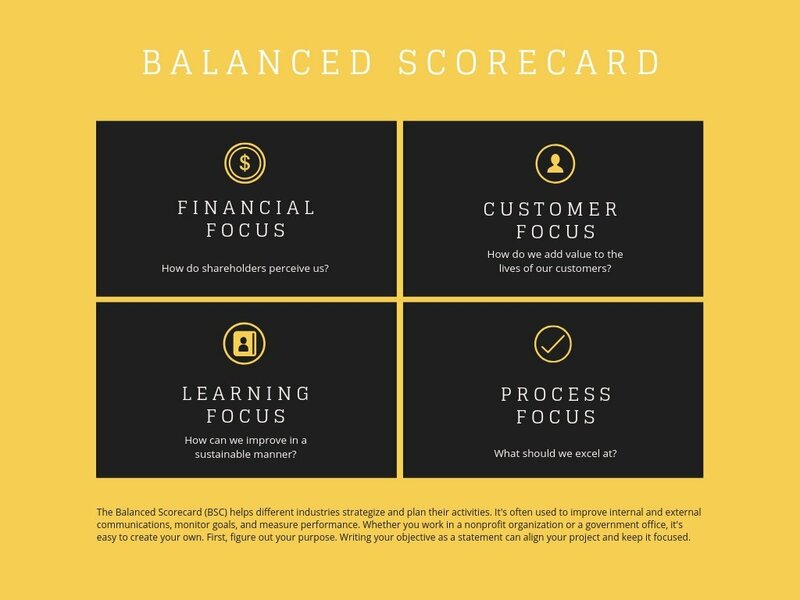 Use a custom balanced scorecard to analyze key areas of your organization. 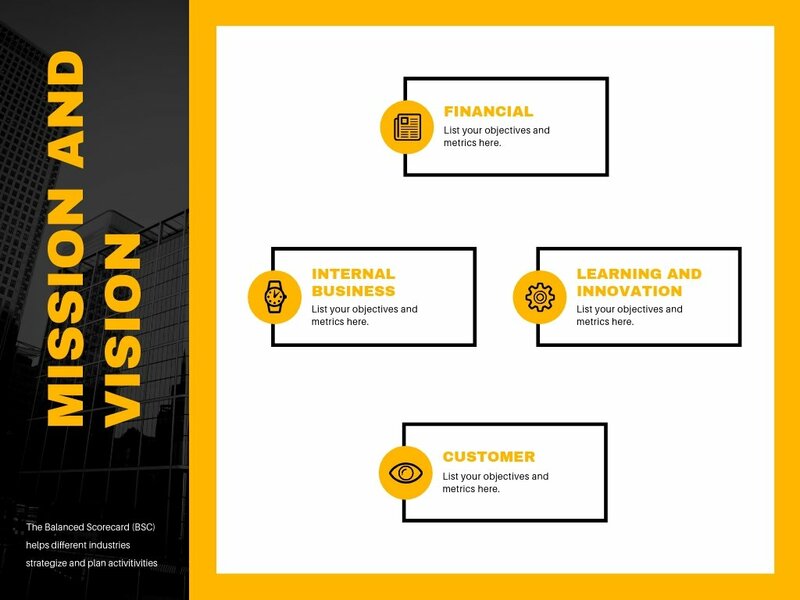 Do you need a top level, visual view of your organization that also takes into account non-financial factors? Then you’ll need a balanced scorecard which is essentially a graphic, strategic management tool encompassing various components of an organization. Develop one to help analyze the key areas of your organization like business processes, customers, financials, and growth. You can then set about fixing or improving them, by developing strategic initiatives and identifying some clear, actionable and measurable objectives. Sounds complicated? 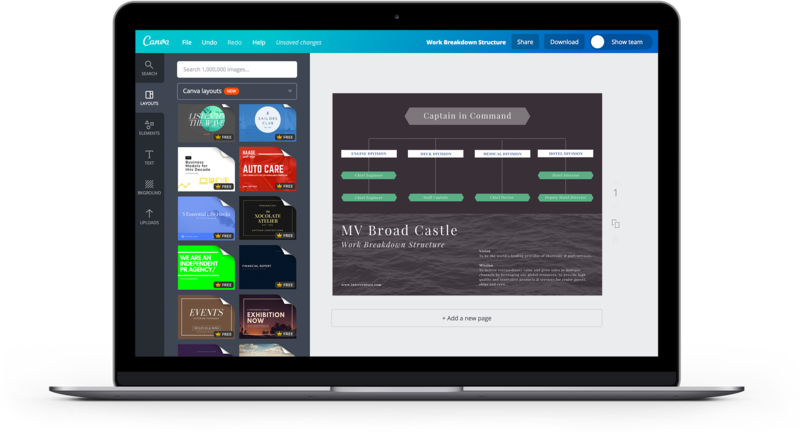 With Canva’s easy, drag-and-drop design tools, creating a balanced scorecard is really simple. Our intuitive, user-friendly interface will have you up and running in no time, even if you have never designed a thing in your life. Simply choose a template and start customizing your design. And did we mention Canva is free? It’s as easy as creating an account to get your design off the ground and your organization running smoothly. 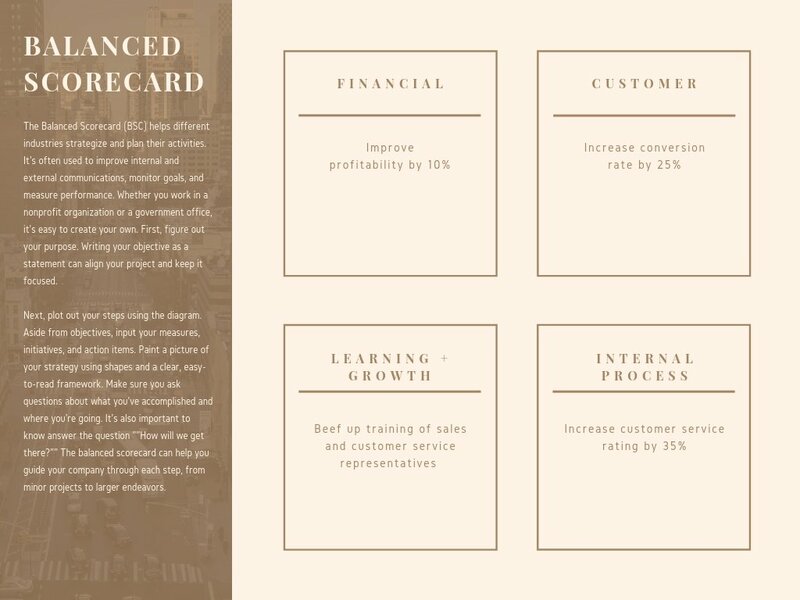 Create a new Canva account to get started with your own balanced scorecard design. 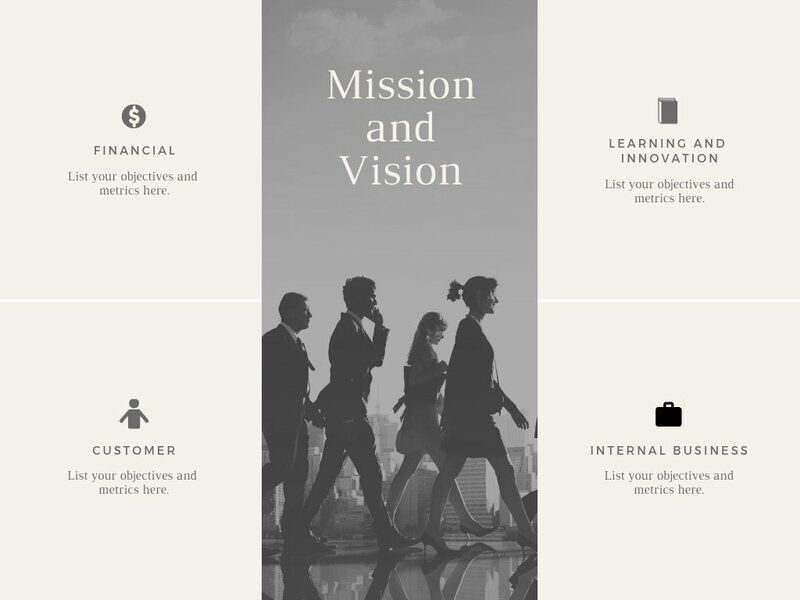 Creating a balanced scorecard can help managers and business owners from any industry connect the dots between the top level objectives, vision and mission of an organization down to other key areas such as growth capacity, processes, customers and finance. From there, they will be better able to develop specific targets, measures or KPIs, and action plans for each area. 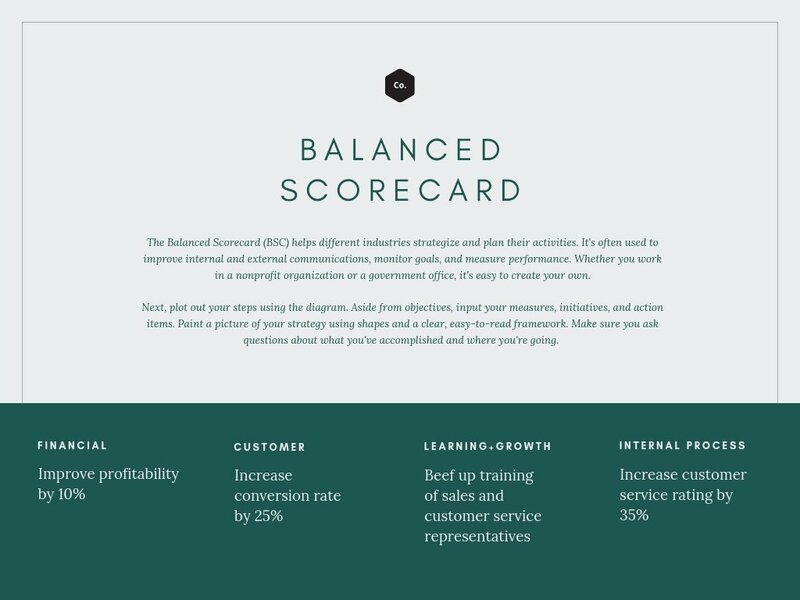 Since a balanced scorecard is a visual strategy tool, Canva gives you access to thousands of elements such as icons, shapes and lines to use on your design. Connect one area to another using arrows and lines or distinguish one component from the other using colors. To search and add elements to your design, simply head to the element pane and choose the icon, shapes or line folder then click or add any to your design. If you need to get the branding of your design just right, fear not help is at hand. Consistent branding is a breeze with all of Canva’s free tools including over 130 fresh fonts, and any hex under the sun thanks to our awesome color palette tool. You can also upload your own logo by going into the Uploads pane and selecting any PNG, JPG or SVG file from your computer. Once uploaded, it’s automatically stored into your uploads folder and will be ready to for use on your next designs. As a strategy map, it only makes sense that everyone in your organization is brought up to speed with the strategies and objectives you’ve outlined. Once you’re done designing, click the Share button on the editor toolbar and choose the best means for you. Send a copy via email by typing or pasting in emails into the provided field or sending them a link to give them either viewing or editing access. 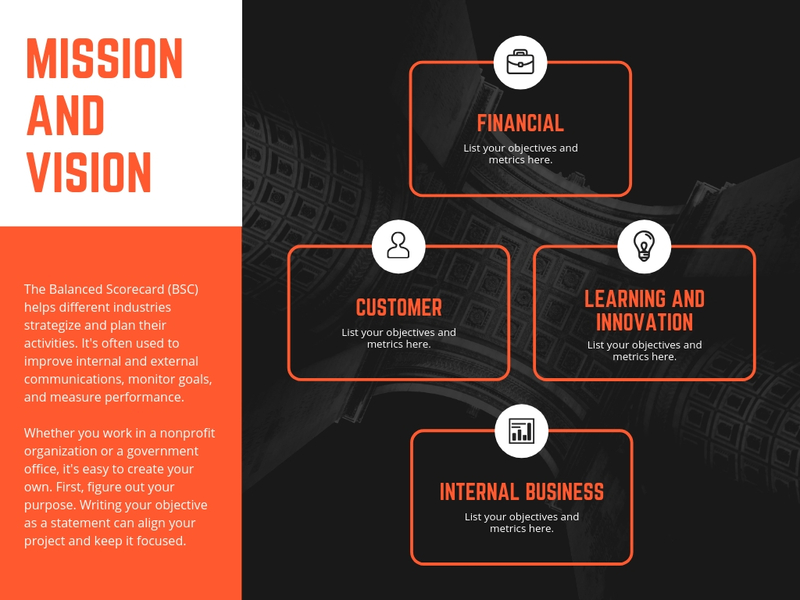 You can even embed your new balanced scorecard design into your blog or website. 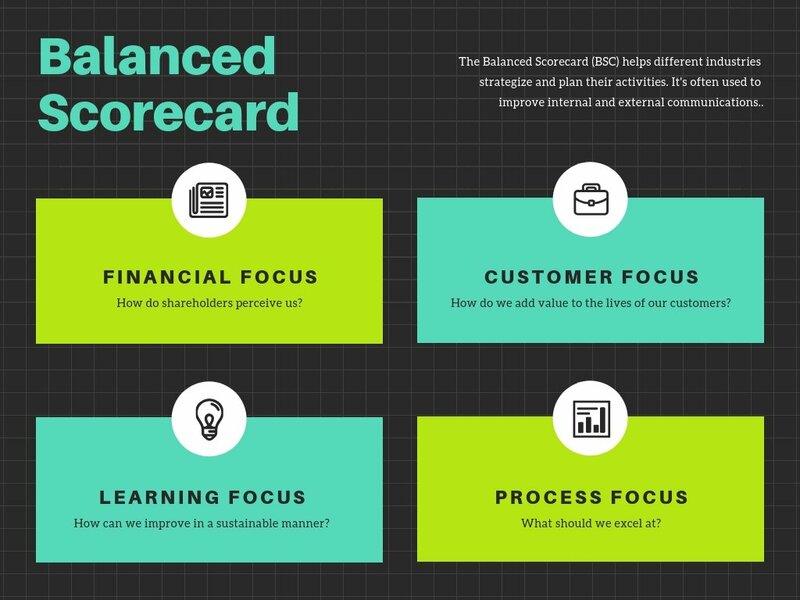 Simply head on over to www.canva.com to start creating your balanced scorecard. You don’t need to download Canva, just create an account and log in. If you want to design on the go, download our free iPhone and iPad app from the App Store and our Android app from Google Play. How does collaborative design work in Canva? Creating balanced scorecards would often take the collaborative effort of many different teams and individuals. 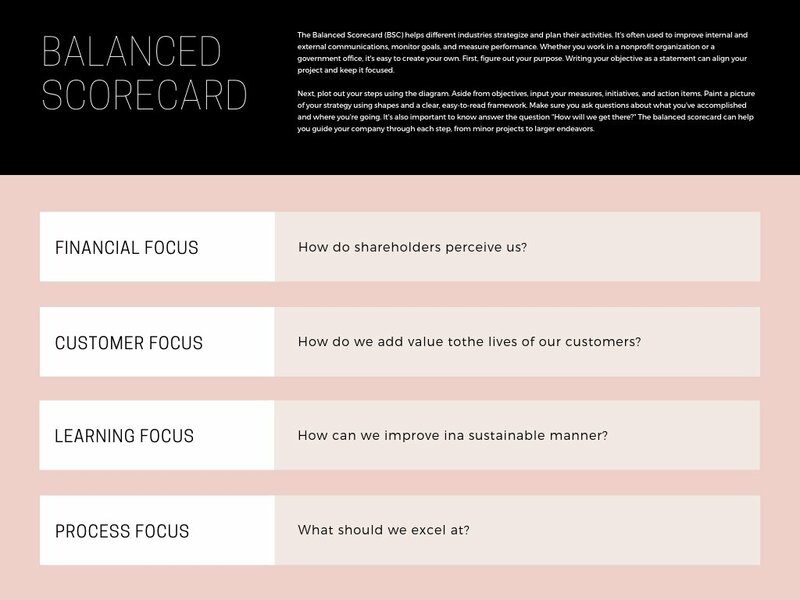 To share your balanced scorecard design with a colleague who might be able to lend a hand with the design, simply click the Share button on the editor toolbar and inviting them to edit the design by emailing or sending them the link directly. Make sure you’ve chosen the Can edit option before sending. How much does it cost to create a balanced scorecard in Canva?